Know Ye, that Asa Roberts a Private of Captain ? ?mon’s Company (I) 31st thirty-first Regiment of Illinois Vols who was enrolled on the 15th fifteenth day of August one thousand eight hundred and sixty one to serve three years, is hereby Discharged from the service of the United States this 26th twenty sixth day of July 1862 at Cairo, Illinois by reason of Chronic peritonitis and he is perfectly unfit for service. Said Asa Roberts was born in Roane in the state of Tennessee is 26 twenty six years of age, five feet eight inches high fair complexion grey eyes dark hair and by occupation when enlisted a farmer. Given at Cairo this 26 day of July 1862. Brig Genl ??? Dist of Cairo. Asa Roberts enlisted 15 Aug 1861 for 3 years into Company I, 31st Regiment, Illinois Volunteers. He was discharged 26 July 1862 at Cairo Illinois due to Chronic Peritonitis. Description: 5’8”, fair complexion, Grey eyes, dark hair. Well, at least they did back in the 19th century. My second great-grandfather, Asa Ellis Roberts, came from a large family. He was one of at least 16 children. He too, had 16 children, 12 with his first wife and another four with his second wife. A father, farmer, and Civil War veteran, he led a hard life. Asa Ellis Roberts was born on 28 February 1835 in Roane County, Tennessee., He is the son of John Calvin Roberts (1795-1873) and Elizabeth Blackwell (1796-1867). Map of Asa Ellis Roberts Life. Acy, as he was probably known of as child, was the 12th of 16 children. He grew up in Roane County, Tennessee. Apparently, he did not attend school as he still was unable to read and write according to the 1880 Census. I have a lot of research to do regarding Asa’s childhood. It appears that something tragic occurred in 1848, when Asa was 13. It appears, from other researchers’ information, that five of his siblings, Calvin, David, Elizabeth, George, and John all died that year. There are five of his other siblings that I do not have death dates, so it is possible that even more than five of his siblings died in 1848. Definitely, more research is needed. Asa married Elizabeth Minerva Toney (1834-1872) on 19 May 1852 in Rowan County, Tennessee. Asa was 17 and Elizabeth was 18. Shortly after their marriage the young couple moved to Illinois where all of their 12 children were born. William T. Roberts, born about 1853. George Washington Roberts, was born about 1855 in Jackson County, Illinois; he died in 1902. He married Harriet Shinall sometime before 1895; next he married Hariett Alice Burchell on 24 December 1895. John G. Roberts, born between about 1856 and died about 1870 at 13 years of age. Margaret M Roberts was born about 1858. She married William Harvey Porter sometime after 1870. The 1860 Census found the young family living in Township 5S (Ewing Township), Range 3E, in Franklin County, Illinois. Asa was a farmer, living with him was his wife and four children. His personal property was valued at $15. Calvin Logan Roberts was born in December 1860. He married Mary Emeline Fryer, next he married Willie Adeline Harrell, then he married Margaret E. (last name unknown). On April 12, 1861 the Civil War broke out and Asa joined Company I, 31st Illinois Infantry (Union) on August 15, 1861, at Benton, Franklin County, Illinois. His company mustered in on 18 September 1861 at Cairo, Alexander County, Illinois. Cairo is the southern-most city in Illinois and the perfect place to begin a campaign against the Confederacy. Shortly after the battle at Fort Donelson (Feb 1862), Asa entered the hospital for pericarditis (inflammation of the pericardium – two thin layers of sac-like tissue that surrounds the heart). On 23 July 1862 Asa was discharged for “Chronic Pericarditis.” His physical description at discharge was 5’8”, dark hair, gray eyes, with a fair complexion. Sarah Angeline Roberts was born on 5 March 1863. She married Daniel Rufus Baltzell. James Monroe Roberts was born in June 1865. He married Nancy J. Huckshorn. In 1865 Illinois held a state census which indicated Asa and his family were living in Township 4S, Range 1E, Jefferson County, Illinois. Then tragedy struck over and over and over again. Three children in a row died as infants, 1866, 1868, and 1869. The 1870 Census finds the family living in Township 4, of Jefferson County, Illinois. Asa is still a farmer and his personal property value had grown to $400. With him are his wife and six children; William, George, Margaret, Calvin, Sarah, and Monroe. It appears that his son John G Roberts had already passed. In 1870, John C. Roberts was born. He died in 1873, living only three years. On 26 May 1872, Asa’s wife, Minerva died. I don’t know if it was as the result of childbirth, but I suspect it was. Because another child was born and died as an infant in 1872. On 25 August 1872, Asa married Patience Anna Marshall Dean (1845-1919), in Jefferson County, Illinois. Asa was 37 and Patience was the 26-year-old widow of Thomas Dean. Patience had two children with Thomas, Elnora and another child who had passed already. With John C. Roberts’ death in 1873, that made five children in a row born and died and six children passing within only seven years. Asa’s father, John Calvin Roberts, also died in 1873. However, Asa and Patience had their first child together Charles Wilson Roberts on 5 July 1873. 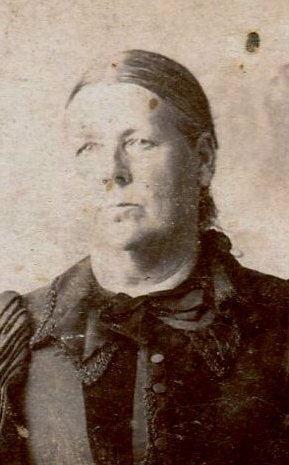 Charles married Clara Farmer on 29 January 1891. Rosa Della Roberts was born on 26 May 1875 in Jefferson County. She married James Lawrence Derrington. Florence Elizabeth Roberts was born on 21 January 1880 in Ewing, Franklin County; she died on 26 October 1948 in Sesser, Franklin County, Illinois at 68. She married Frances Perry Scott on 24 March 1901, next married Spencer. She had 2 children I know of: Nellie and Alfred. By the 1880 Census, all of the children Asa had with Minerva had moved on and his household in Elk Prairie Township, Jefferson County, Illinois, consisted only of him, his wife Patience, their three children together (Charles, Della, and Florence) and Patience’s daughter from her marriage to Thomas Dean, Elnora Dean. Hugh Ellis Roberts was born on 2 July 1884 in Jefferson County. He died on 30 August 1908 in Ina, Illinois at the age of 24. He married Clora Dell Scott on 7 October 1900. They had 4 children: Harry, Carrie, Bert, and Mabel. Asa Ellis Roberts died on 5 October 1886 at the age of 51, was buried at Hope Cemetery in Spring Garden, Jefferson County, Illinois). Research the death dates for 5 siblings for whom I don’t have dates. Research the causes of death for the siblings who died in 1848. 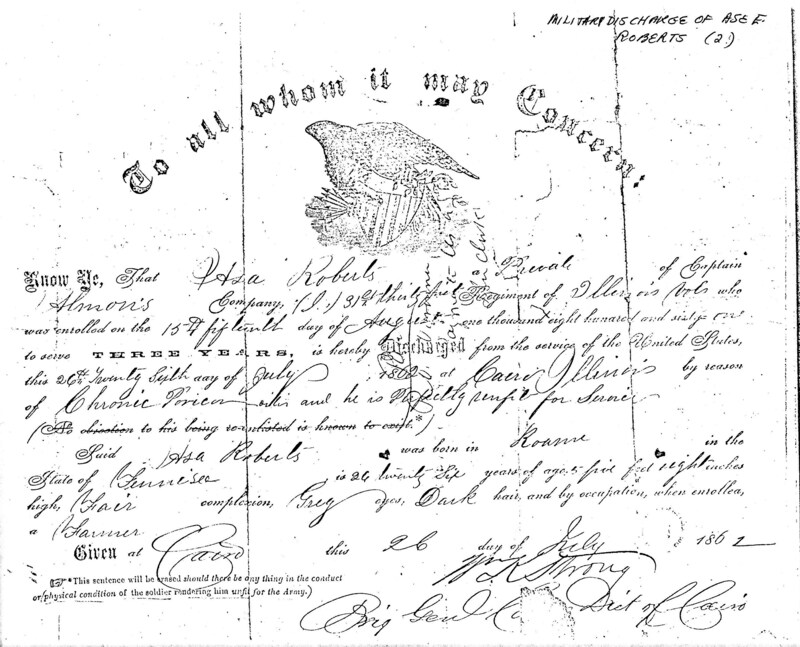 Research Asa Ellis Roberts’ Civil War Record, his pension application, and the pension application of his widow, Patience Anna Marshall Dean Roberts. Note: Chris H. Bailey indicates that Asa was born on Feb 18 and that his father’s bible is what indicated 28 Feb. His date is probably based upon either Asa or Patience’s civil war pension record. I need to research those records closely. That said, his grave marker and other secondary sources are all in agreement as to the 28 February date. Family Search: Tennessee State Marriages, 1780-2002 / Asa Roberts – Elizabeth Toney. Note: Some researchers suggest that Elizabeth Minerva Toney’s first name was Cynthia. My use of Elizabeth is based upon this marriage record. 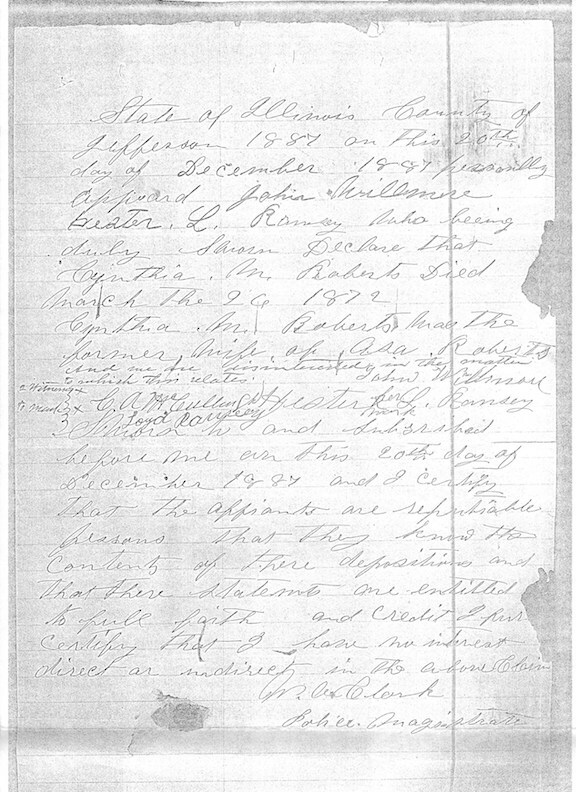 Chris H. Bailey – “Descendants of John Calvin Roberts & Elizabeth (Blackwell) Roberts of Roane County, Tennessee”; Page 10 (Person 10) Asa Ellis Roberts. Family Search: 1870 Census – Township 4. Range 3, Jefferson County, Illinois, Line. Many thanks to Chris H. Baily for his “Descendants of John Calvin Roberts & Elizabeth (Blackwell) Roberts of Roane County, Tennessee.” His research confirmed much of the research I did, provided new insight into Asa Ellis Roberts’ life and the lives and even the existence of some, of his children.